When you own a property, you want it to be as energy efficient as possible. When you live in it, you want to keep your bills down for gas and electricity. When you rent it out, you want it to rate highly as this helps to maximise the rent you can charge and keeps tenants happy. Even for commercial properties, the right insulation is key to creating a comfortable and productive workplace. So how do you get the best insulation board for your property? 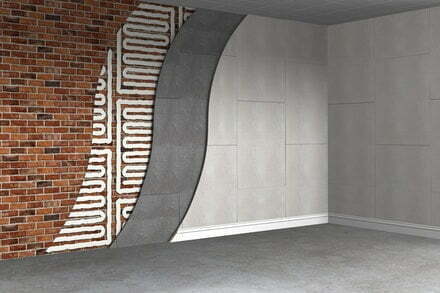 Insulation is a varied and wide area with many different products in it. You will look at different products when you are insulating the walls of the property versus the loft. So the first step is to single out the products that are designed specifically to insulate walls and what makes them worth considering. The Stormdry system is one that has been utilised by homeowners and property owners around the UK. Their EP Board uses a clever combination of high performance, low profile aerogel to create an internal wall insulation board. It combines the 10mm aerogel blanket with a 3mm magnesium oxide plasterboard. What this means for property owners is that the insulation has high thermal resistance even though it is only 13mm thick. Another big advantage of the system is that it is breathable and helps to minimize problems with trapped moisture and condensation. As our homes become more airtight, condensation is becoming a bigger problem. Condensation can easily lead to damp problems due to a lack of airflow. This insulation systems helps to keep warmth in but also let the room breathe and reduce the chance of condensation forming. When you are considering products such as the Stormdry EP Board, it is good to look at what benefits it brings. For example, these boards can save heat and energy and reduce U-values. A U-value is a measure of how effective a material is as an insulation with the rating shown in terms of heat loss – the U-value. This board can be applied to a previous damp solid wall that has been treated with a special product such as the Stormdry Masonry Protection Cream. 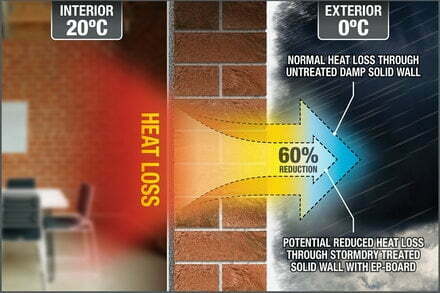 This will help to improve the insulation performance and save energy bills. Used together, these products can move a U-value of a solid wall from 2.1 to 0.8. Another benefit to using this kind of insulation is that you can easily comply with the regulations. If you are a property owner who rents out the house, current property rental regulation says that the house must have an Energy Performance Rating (EPC) or E or above to be rented out to tenants. The problem comes that many older, solid wall properties are harder to insulation than newer properties and landlords are being forced to take them off the rental market. However, with the addition of the right wall insulation, this problem can be remedied, and the property put back up to rent. Whether you live in the house or rent it out, you always want home improvements to be done as quickly as possible. With the Stormdry EP Board, the system of installing is a quick one. The board is applied directly to the walls of the house using a special foam adhesive. After the board is in place, skim plastering and decoration can then take place as normal. Using the board has been shown to improve U-values by 61% versus a normal solid wall without the insulation, ensuring the property is much more energy efficient, pleasant to live in and also reducing the risk of damp problems.